The leader of the Navy's celebrated Blue Angels flight team is stepping down after admitting to leading jets in an "unacceptably" low-altitude stunt. Navy Cmdr. Dave Koss volunteered to be relieved of his duties after admitting days following a performance at Lynchburg Regional Air Show on May 22, that the movement he carried out "had an unacceptably low minimum altitude" and was not in accordance with airborne standards, according to a statement from the Naval Air Forces. "This maneuver, combined with other instances of not meeting the airborne standard that makes the Blue Angels the exceptional organization that it is, led to my decision to step down," Koss said in the statement. Even though the maneuver went off without injuries and all members of the Blue Angels Team landed safely, after a safety review several of the team's shows were cancelled, including a midweek show at the U.S. Naval Academy and performances scheduled over the Memorial Day Weekend. This Blue Angels also canceled scheduled performances at the Rockford Airfest June 4 and 5, and at the Evansville Freedom Festival Air Show June 11 and 12. In the meantime, according to the statement, the Blue Angels were to stay in Pensacola, Fla., for more training and air show demonstration practice. Safety issues are not new for the esteemed flying team. 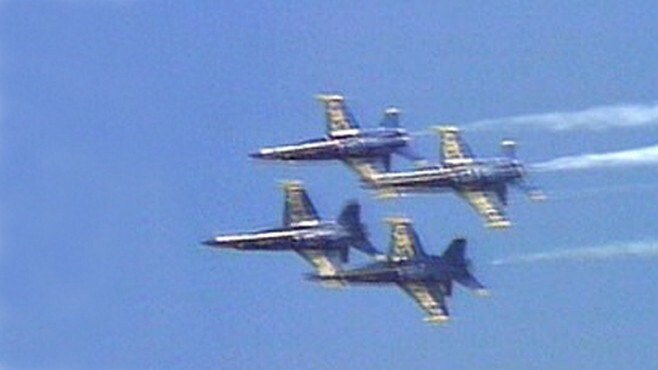 Thousands watched on April 2007 when a Blue Angels' jet crashed during a South Carolina performance. The Beaufort, S.C., crash killed one pilot and injured other members of the team. In 2004, Lt. Ted Steelman suffered minor injures after being ejected when his aircraft struck water one mile off Perdido Key in Florida. The accident was the result of engine and structural damage. Koss will be replaced by Capt. Greg McWherter, who was the previous Blue Angels' commanding officer, for the duration of the season. The Blue Angels have performed at military and civilian air shows across the country since 1946. The Blue Angels Demonstration Team currently flies the F/A-18 Hornet strike fighter, an aircraft with both fighter and attack capabilities. Their performance season runs from March to November.